Such a pretty, tabbico cat, only a year old…. PATRICE lived outside a Holbrook apartment complex. When their owner was evicted, her indoor cats were thrown outside. A Last Hope volunteer (actually Linda, Last Hope prez) trapped PATRICE…. And, lo & behold, pretty PATRICE is also friendly (which make the feline eviction even more cruel). 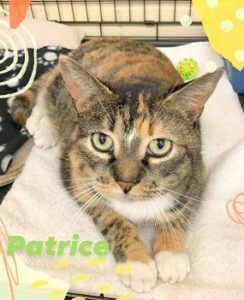 More important- PATRICE is at Last Hope in Wantagh looking for a purrfect, permanent placement.